Halloween is a holiday that's been designated just for basic witches like you. You can feel the excitement flow throughout your coven. All the sudden the mist flowing out of Willow Moonfall's cauldron smells like pumpkin spice and you're pretty sure Helga the Horrible is working on a brand new charm to make herself look young enough to go trick-or-treating again. Why else would she be stalking the real estate sites to find the highest income houses? When it comes to Helga's taste in chocolate it's king-sized or someone is getting the scrimpers curse. She's been that way since the Salem trials. You can't blame her. Anyway, what we mean to say is, once you get to this time of year, you can't seem to keep your excitement hidden for very long! You'll be ready to cast some spells. . . or simply order a pumpkin spice latte with class when you're wearing this comfortable t-shirt dress with cold shoulder details. 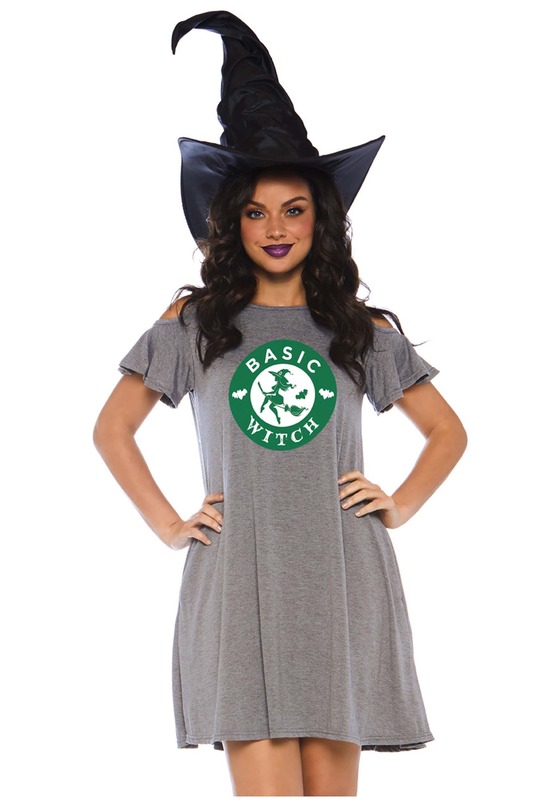 The front flaunts a printed logo with a sassy witch on a broomstick and words that proudly proclaim the title of "Basic Witch". Because who wants to choose to be good or bad when you can be a beautifully basic witch! It's about time we gave witchy women a choice in clothing that surpasses tattered black lace and gingham patched skirts. They deserve a spot to proudly proclaim their mystical leanings in the public arena! This would be the perfect look for Halloween night paired with a pointy hat and black lace-up boots but it can be dressed up and down. Whether you pair it with a plaid shirt for a seer next door look or a black leather jacket so everyone knows you're a boss enchantress, it can be worn throughout the freaky and festive season!